What r the bookcases-custom or brand? Great looking! I would like to know also!! Thx. what type of material is used for the shelving? thank you! what is the brand of the windsor chair in the picture? What is the brand of chair in this photo?? who makes the light above pool table? Paint in the walls - What color was used on the walls? Shouldn't the white square be on the player's right? Where is the lucite table from? 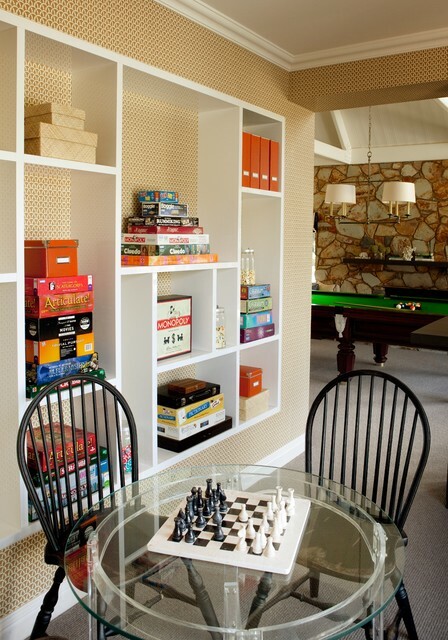 Windsor chairs make a surprise pairing with a Lucite table in the game room. Lulu DK wallpaper swathes the walls and continues to the backs of custom shelving units, giving the space a harmonious flow. Fun and games. Rubin filled a bookcase with board games, puzzles and glass jars full of tiny items like costume jewelry and marbles. She mixed in her own childhood toys and her girls’ silver rattles. Designate a spot for projects and games. Give this area a pass on daily cleanup. Instead use it for long-term projects like organizing that box of photos, a 1,000-piece puzzle or a nightly game with the family. Becky Harris added this to Houzz Call: Share Your Winter Storm Jonas Photos and Survival Tips! 2. Start with a game. Some nights people just aren’t ready to talk. On those evenings we often start with a check-in game. Sometimes it is Rose and Thorn. (Everyone shares the best part of their day, their “rose,” and the hardest part of their day, their “thorn.”) Other times it is Kind, Brave and Failed. (Each person lists one time they were kind, one time they were brave, and one time they failed that day — all are celebrated.) There are also great conversation starter game kits that you can buy just for this purpose. Whatever way you go, these icebreakers allow everyone to get their conversational juices flowing. I don't like the furniture but I like the concept of game storage and game table.